Home > Mutual Funds - Equity > How Retail Mutual Fund Investors can Build a Low-risk Portfolio for 2019..! 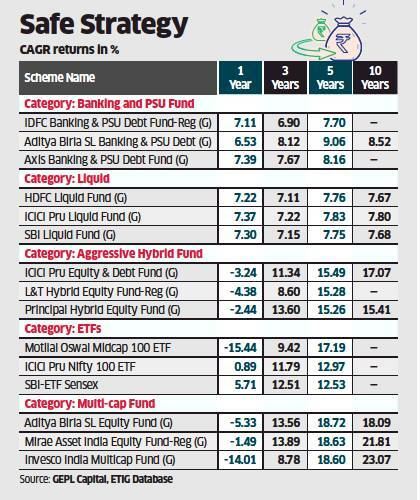 How Retail Mutual Fund Investors can Build a Low-risk Portfolio for 2019..! For retail mutual fund investors, 2018 has been rather dismal. Accord Fintech, 30 investment plans of 32 large-cap schemes have been unable to outperform their benchmark indices. The key reason for this is the lack of earnings growth, which has made the task of identifying ideas a tad difficult for fund managers. Experts point out that earnings growth in 2019 would not be secular either and only select themes would work. They suggest a combination of banking and PSU bond schemes, liquid funds of large Asset Management Companies (AMCs), and balanced and multi-cap schemes (with at least five-year SIP horizon) for retail investors to tide over the various uncertainties in 2019. The uncertainty surrounding the general elections outcome, the pace of interest rate increases by the US Federal Reserve, and geopolitical unknowns in 2019 point to periods of extreme volatility. To deal with this, retail investors require a low-risk portfolio, which holds the promise of reasonably good returns in volatile markets. “There are quite a few important developments next year and these may keep the markets volatile.... To beat this volatility, I think retail investors need to create a fairly defensive portfolio,” said Mr. Kaustubh Belapurkar, director (fund research), Morningstar India. Experts point out that 50:50 allocation to equity and debt spread across pure debt, balanced, Exchange Traded Funds (ETFs) and multi-cap schemes would help investors construct a relatively low-risk portfolio. “I think this is the right time for retail investors to construct a proper low-risk portfolio with careful allocation and which also deliver reasonably good returns in the long-term,” said Mr. Rupesh Bhansali, head-mutual funds, GEPL Capital. Bhansali suggests that if a retail investor has hundred rupees, he or she can invest 25% of the money in banking and PSU bond schemes, 10% in liquid schemes, 10% in gold ETFs, 20% in balanced schemes, 15% in Nifty ETFs, and 20% in multi-cap schemes. Experts suggest retail investors invest in multi-cap, balanced funds and ETFs with a minimum investment horizon of five years. They recommend a five-year Systematic Investment Plan (SIP) route to buy these schemes.